Get One of Each Size! The Ultimate Hair & Lint Removal System. Buy all four of our washable sticky rollers as a set and get them for an incredibly low price. This deluxe set will ensure that you have the perfect tool for any type of job. Each piece is incredibly sticky and well suited for quickly picking up lint, dust, dirt, hair and more. Once you are done cleaning just rinse them clean and store for later use. There are no refills or additional purchases necessary. 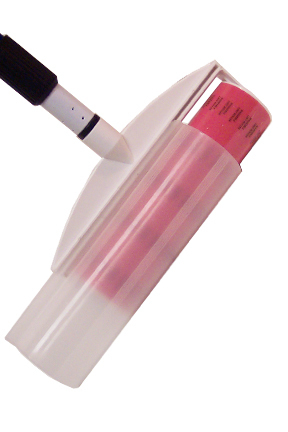 This sticky roller set will last you for years with an endless number of uses possible. The four piece set includes a regular sized roller, a travel sized roller, a large roller with a telescoping extension handle, and a jumbo roller with maximum surface area and an extra long telescoping pole. Just a single pass of one of these rollers will pick up mass quantities of debris, leaving any surface clean in just seconds. Stop wasting money on disposable lint removal products. Get our Deluxe Washable Sticky Roller Set and just rinse them clean with warm water and reuse them over and over. They are fast, easy-to use and they produce outstanding results. Want to purchase them individually? Use the following links: mini lint roller, regular lint roller, large lint roller, jumbo sticky roller. Don't need the jumbo size roller? Then our 2 piece or 3 Piece Lint Roller Set would be a better option for you. Keep clothes, carpets, upholstery and curtains free of dust, lint, fuzz, dirt, pet hair and more. 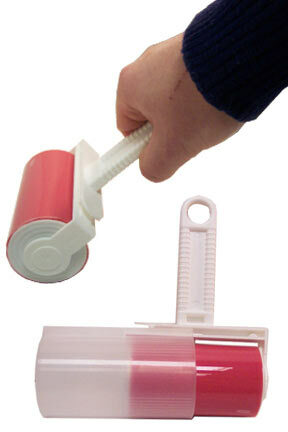 Use a sticky roller to quickly remove unsightly messes easily and efficiently. The unique, reusable design of these rollers means you don't have to buy any expensive tape refills ever. They are always ready when you need them, and they won't lose their stickiness for years. Just rinse under warm water to release all of the collected debris. If the sticky starts to go away, a thorough cleaning with soap and water or rubbing alcohol is all you need to bring them back to new condition and make the roller just as sticky as ever. Use the included dust covers for protection during storage. Don't be fooled by cheaper knock offs that won't last as long, or produce the same style results. This high quality set is sure to work as intended, and will last for years of use. This sticky roller set includes four different sizes of rollers. 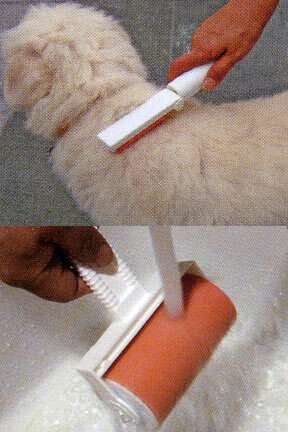 The regular sized roller can be used all over, and is useful for many applications around the home, office or vehicle. It is a perfect hand held tool, and can be used for quick jobs on clothes, furniture and upholstery. The smaller travel sized roller is small enough to fit in your pocket, glove box, purse or desk drawer. This makes it great for travel, or ideal for stowing away everywhere so you always have one handy when you need it. The large size roller comes complete with an extendable steel handle so it is great for draperies and floors. Use the jumbo roller for your big jobs, or to clean large areas. It has a full length telescopic pole, and the largest roller size. This one is perfect for floors and hard to reach areas. Use it to take debris off a bed spread that can't be washedm, or to quickly remove hair from your bathroom floor. Anyone would love this set, but pet lovers can't live without it. Don't let dog or cat hair control your life. Get this washable sticky roller set to make cleaning it fast and easy. Uses removing lint, dust, pet hair, etc. Jumbo Roller Size 8" x 2.25"
Large Roller Size 7" x 2"
Medium Roller Size 4" x 2.25"
Small Roller Size 3" x 1"
Sticky Roller Set - Order all four at an incredibly low price. Easily remove lint and hair from any surface. Great for clothing, furniture, floors, drapery, your car and more. Just rinse with warm water and use it over and over. Stop using disposable rollers and wasting money on refills. Order Yours Today. I have use the large roller for 6+ mos to pick up pet hair and dust on our carpets. Works great especially for a quick tidy up. I even used it after vacuuming and found it still picked up stuff. It's easy to clean and easy to store. I found the sticky cover begins to show wear and tear in about six months. It's still sticky and useable but I decided to replace it with a new one. I didn't have any replacement info because my wife bought the original unit at a trade show. It would be nice to have a sticker on the handle giving replacement information and special prices, if any. Because I do intend to use it over long term, I bought 2 to ease the shipping costs. It's a soft, plastic-y material similar to silicone. 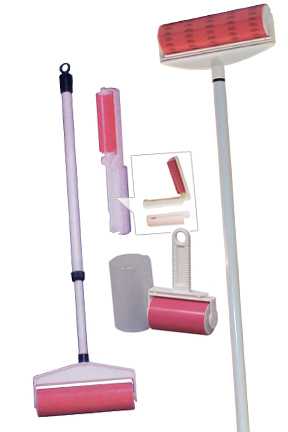 The stickiness is long lasting, and the roller is safe and gentle on all surfaces. Not Sticky Anymore? Follow these easy steps to get the sticky back.